Soup weather, that’s for sure, also here in Georgia. The low temperatures we have right now, we have not had for a while, so soup is appropriate, soup is warming. 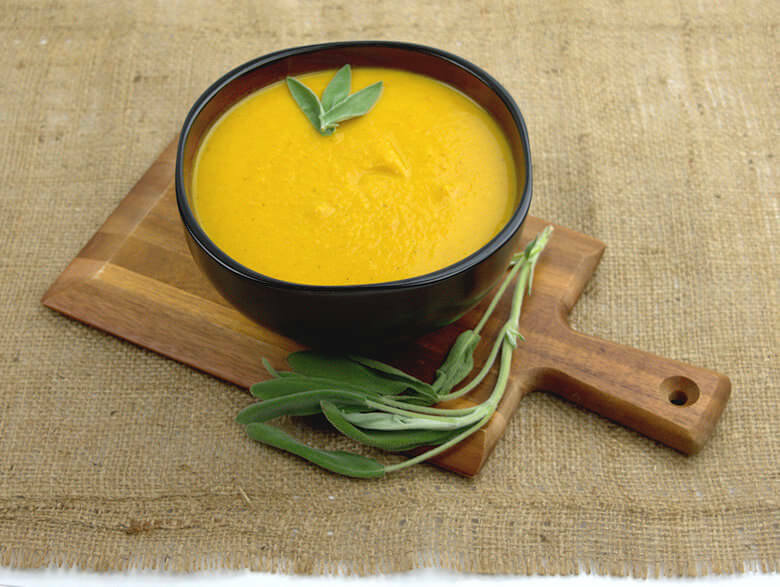 Roasted Squash Carrot Soup with Chicken is colorful, flavorful, full of veggies and low fat chicken and chicken stock. Are you a person who makes New Year’s resolutions? I am certainly not, well may be a little. I whisper new goals and wishes to myself and by doing so, I may make some resolutions. Every year I set personal and business goals and every year I express wishes for the world. To start with the world wishes; I wish people to be more tolerant; why do we dislike one another so much, why is there so much hate and distrust. Why is there so much me and so little we? Questions and no answers – no solution to world peace. I wish I did, but I am realistic enough that world peace will not happen in my life time, if ever and I am not a pessimist. A little closer to home is respectfulness. I wish people would have more respect for each other. How often has it happened to you that you are in the check-out line for a grocery store and somebody in front of you thinks it is more important to finish her/his phone call or text than checking out or putting the groceries on the belt. So we all wait for that one person and when you say something, he/she is offended because can you not see she/he is on the phone. Sitting in a movie theater is no fun either, because peoples phones go off, text messages come in all the time, people talking. Why would you go to a movie theater and not watch the movie. If your call or text is more important than the rest of us, please find your own space and show some respect for the people who came to watch the movie. How often did somebody bump into you because they were on their cell, totally oblivious to what is happening around them. When that happens, they expect you to apologize, because you did not go out of your way to avoid that collision. The other day, I saw a woman pushing her shopping cart while she was doing something on her phone and she walked straight into a display. Nobody was hurt, nothing bad happened, but I giggled. She saw that and became angry with me. I almost apologized and said, “you should have seen yourself; it looked so silly”. My own thoughts for 2018; find some down time, instead of working 7 days a week. When you have your own company that is not an easy task, especially when your company is something that grew out of a hobby. We did not have much of a Christmas, it’s like that for year already. The reason is, that I have to work very hard to get all my orders out to you, so your Christmas is filled with delicious gourmet items. 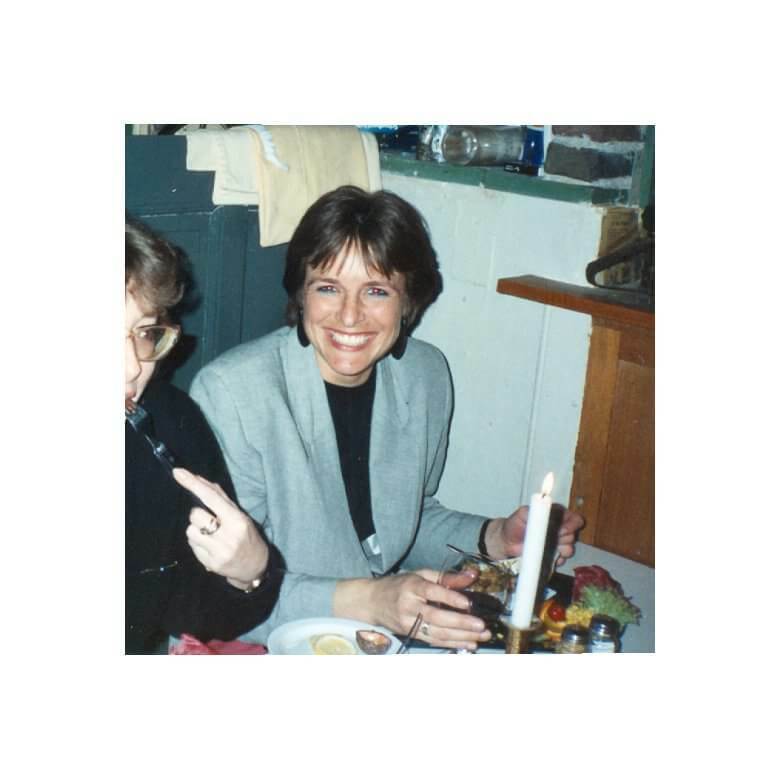 No complaints; I started my company in the hope that I could bring gourmet food to everybody, so more people can enjoy and explore and experience what the world has to offer. That means that my company has to work hard to make you happy during the holidays. And let me tell you, I am happy when you are happy. I love what I do, but I need to work on recharge my own battery every now and then; turn off my work, my hobby just for a day here and there, that’s what I need to do. That down time from work needs to become an up time for my personal life. More laughter and fun, more moving around, more and new relationships, more enjoyment of life. And who knows, may be more down time gives me less wrinkles, makes me sleep better, longer, less worries 🙂 A restful mind, a happy mind. Cooking is one of my enjoyments. So I am not cutting back on cooking. Should I cut back on eating? No, don’t think so. I am not overweight, could my thighs be slimmer, yes, my tummy tighter sure, but no diet can fix that. I prefer not to talk about cutting back; I prefer to talk about more. Not necessarily more food, but more good and healthy food, and variety, more flavor and more texture . There it is again, my quest for texture, different textures. Texture adds to enjoyment, whether it is smooth or coarse or a mix. Today’s recipe is soup; it is soup time right now. 15 degrees F at night here in Georgia, it is hard to believe. Nothing to write home about, for all of you who live north of us; but here in GA it is pretty cold. Cannot wait for spring and summer to start. My soup recipe today is a Roasted Squash Carrot Soup with Chicken. Warm color and totally soft and yummy. Just by looking at the color and the texture you will feel warmer inside already. The carrots and butternut squash are diced and roasted in the oven until soft. Then in my soup pot I cooked diced onion with curry, turmeric and ginger. Lovely aromas filled the kitchen. Then I added the chicken stock with chicken. See how I make chicken stock in this recipe Tomato Chicken Pasta Soup. Most of the times when I make chicken stock, I also keep the chicken meat; freeze chicken stock and meat together. 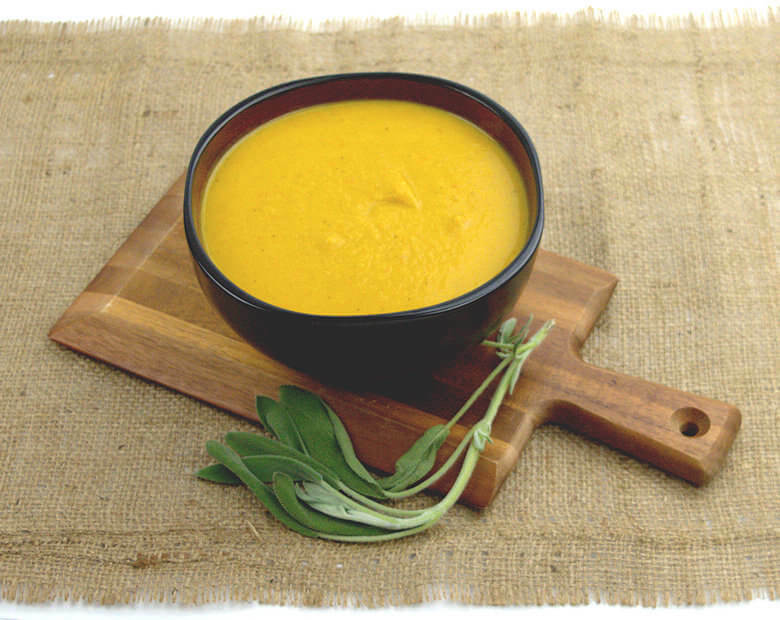 If you prefer to keep it vegetarian/vegan, use vegetable stock instead; you’ll still have a wonderful Roasted Squash Carrot Soup. Cook the soup until onions are soft and in the meantime the carrots and squash are done as well. Add carrots and squash to the soup and blend. I used an immersion mixer and blended the entire Roasted Squash Carrot Soup with Chicken into one big pot of yellow velvet. If you prefer pieces of chicken instead, by all means cut them in pieces and add them after the blending. Enjoy my Roasted Squash Carrot Soup with Chicken. Soup weather, that's for sure, also here in Georgia. Low temperatures as we have right now, we have not had for a while, so soup is appropriate, soup is warming. 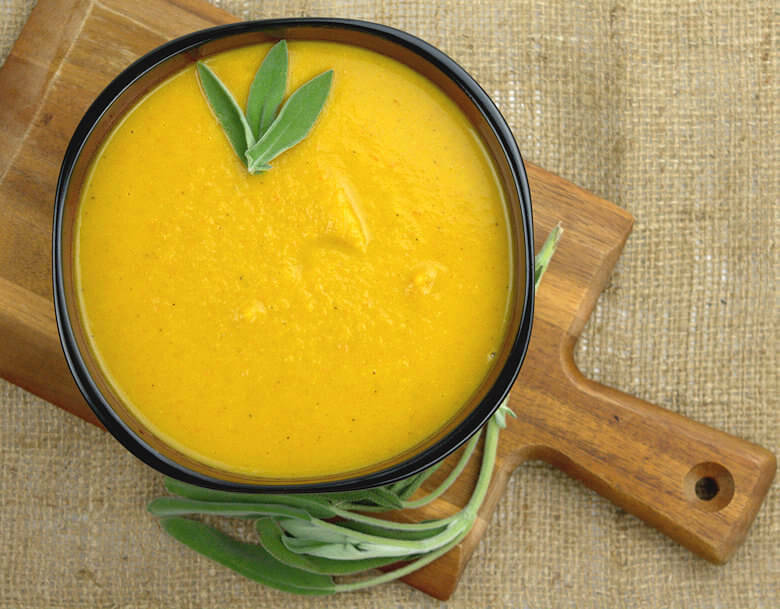 Roasted Squash Carrot Soup with Chicken is colorful, flavorful, full of veggies and low fat chicken and chicken stock. Wash the carrots and cut them in small cubes. Peel the butternut squash, discard the seeds and cut in small cubes as well; similar size as the carrot. Transfer vegetables to a baking dish, sprinkle with olive oil and bake in the oven for approx. 30 minutes or until soft. Dice the sweet onion. Add a tablespoon of oil to a big pot, add the onion and cook for a few minutes.Add a squirt of ginger paste, the curry and turmeric and bake for a few minutes until fragrant. Add your home made chicken stock and chicken and cook until onions are soft. Add the carrots and squash. 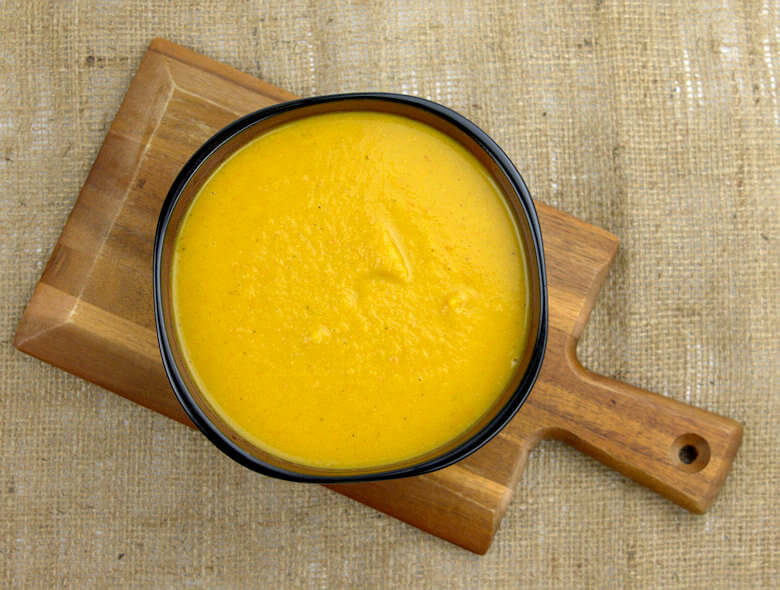 Use an immersion mixer and create a pot of yellow-orange velvet. You can also transfer the soup to a blender. Add salt, pepper and sage powder to taste and serve the soup in bowls or plates.